Some Northfield mandolins in different stages of completion. Listen to Derek Smith work on and play mandolins. 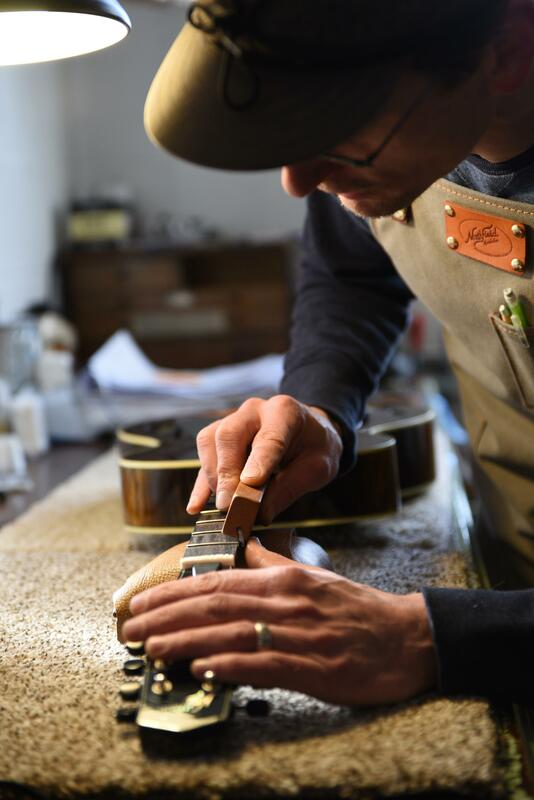 Derek Smith repairing a mandolin which had been allowed to become severely dried out. In a nondescript building in Marshall, Derek Smith is reaming a hole to fit a tuning key into head of a mandolin. That sound is a squeaky and a little irritating. It wasn't long before I asked Smith if he could create a different sound. I asked him to play something on one of the mandolins in the shop, a much better sound. Smith and the rest of the team at Northfield Mandolins make high-end instruments. And the demand for the mandolins is brisk. "It amazes me with all instruments because I've worked with instruments for over 20 years. If not here, I worked with Elderly Instruments is where I started years ago and I wondered all the time and still do where do all these instruments go. Because, we're not the only ones and we're pretty tiny compared to some of the larger manufacturers so apparently there is a large demand and there's some very noteworthy people. Chris Thile on the scene now with his radio show I mean I have to imagine that's giving the mandolin a good boost. It's good for us," Smith said. Thile plays the mandolin on the show Live From Here which airs on nearly 600 public radio stations across the nation, including Michigan Radio. As we walked around the shop, Smith was showing me some of the mandolins being made. 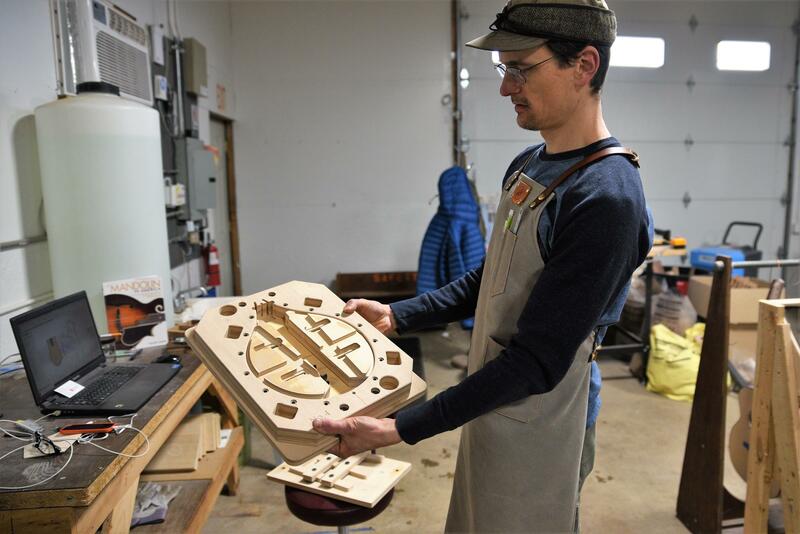 Northfield Mandolins' Derek Smith says he is involved in every step of the process of making mandolins. DS: "We build, oh, I guess offhand probably eight or nine different models of mandolins, all mandolin. Sometimes standard bodies. Sometimes octave mandolin." LG: Yeah, you were showing me that. It looks like a guitar. DS: Yeah. Very much a guitar, traditional guitar body. We've made it significantly smaller than what most people seeing guitars but the flat top embracing nature is all there, but still as eight strings like a mandolin tuned like a mandolin but an octave lower. Northfield also has a shop in Qindao, China. The two shops work cooperatively and ship parts and instruments back and forth. Some of the mandolins made in Marshall get shipped to Qindao and some of the Chinese mandolins are shipped to the U.S. 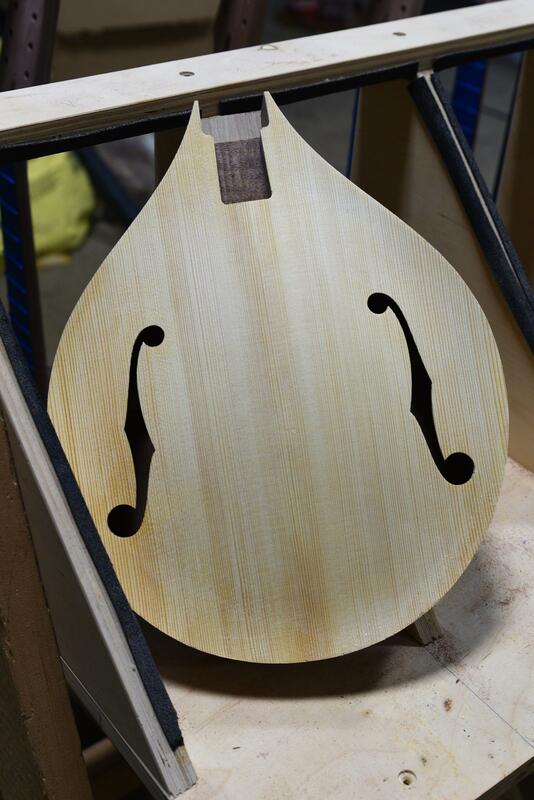 Octave mandolins before the wood is finished. I was curious who was buying higher-priced mandolins. "Oh man. 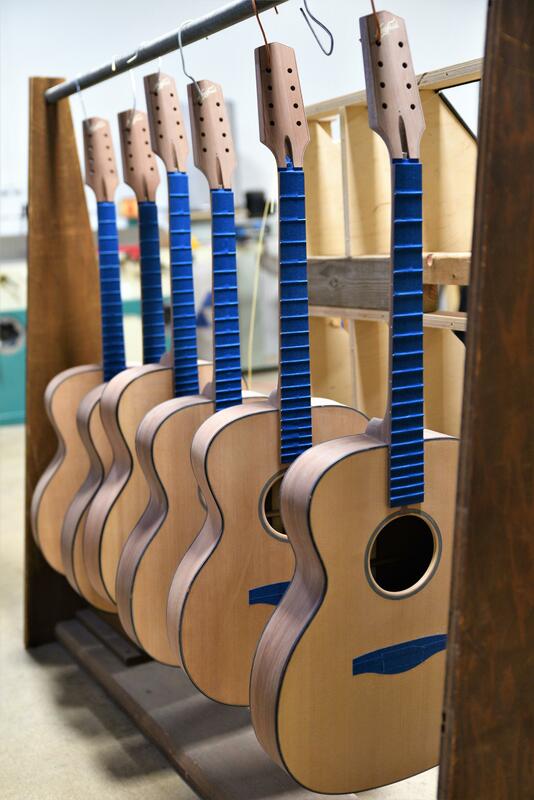 I mean you know most of them are probably residing in the States, but we ship many mandolins internationally as well. I mean, we have dealers several in Europe, one in Japan. We ship to Australia. We ship all over Canada. So in terms of where people are buying it, it's everywhere. There's definitely that strong bluegrass person that's buying our mandolins, but it's finding its way into Celtic music, pop music. I mean there's really... the boundaries these days are really blurred," Smith said. One of the things you notice in the shop are humidifiers scattered around. Smith says keeping a little humidity in the air helps the instruments. He was working on one a customer sent in to be repaired. It was severely dried out. Derek Smith is holding a jig that aids in the early stages of building a mandolin. "On the back, you could literally see there's braces that run inside here and there's a big neck block you could see the maple sucked in around those things it was so I'm amazed it didn't crack. I'm very pleased it didn't crack because I hate repairing cracks if I don't have to." LG: "Tell me what do you like, what fascinates you about being involved in this process of making mandolins or any instrument for that matter." The body of a mandolin before the neck is attached. DS: "Oh, man, you know, I think at the root of it- I was thinking about this yesterday actually cause I was kind of thinking about okay, how's this interview going to go, but what I was thinking of yesterday what really draws me in the process because I touch every part of the mandolin manufacturing process from going and looking at the tree to shipping it out the door and really everything in between. And I think what- when I really find the ultimate pleasure or sort of loss of myself in this work, it's when I'm doing something very simple usually machining wood before it's ever a mandolin. Usually processing a tree into boards and I feel like, I literally feel like I'm part of something that's been done for a very long time. It's almost like an ancestral line if that's not getting too deep with it. It's not for me when I'm sitting there working on a piece of wood. It's like this feels probably pretty much like it did 5000 years ago working on a piece of wood. And for me that's totally cool man. And I really, when I feel that in my bones and I'm working on a piece of wood it's like yep that's it." That’s Derek Smith with Northfield Mandolins in Marshall, our latest Artisan of Michigan. Oh, one more thing… the folks at Northfield have been organizing an annual Marshall Mandolin Summit. It brings players, teachers, and students from all over. Many performances are open to the public. This year it will be held August 8th through the 11th. Tom Fuleky is showing me some of his work. He’s a stonemason and he’s been at it for nearly 50 years. “And it took me 30 to really figure it out. And I know it sounds crazy, but once I figured it out, oh my god, it wasn't as frustrating,” he says. Listen to Steven Durren and Lester Graham talk about making early American style custom rifles. It's early in the morning in the shop of Johnson’s Sporting Goods in Adrian. 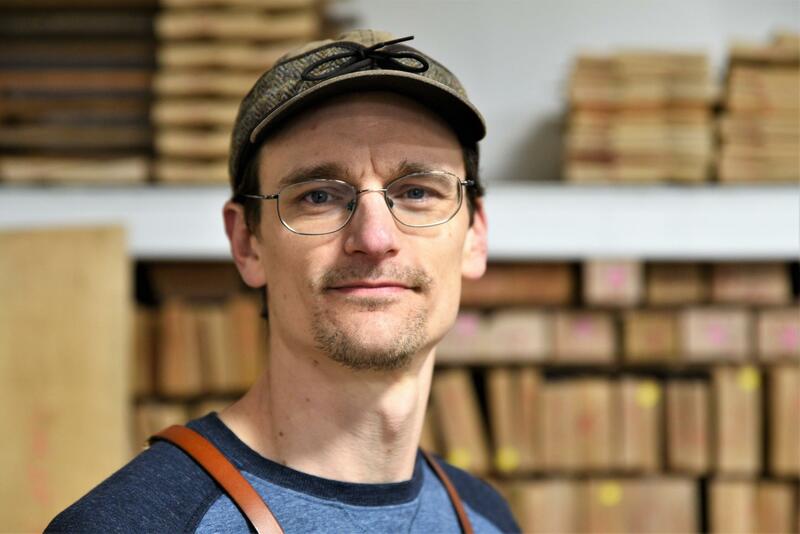 Steven Durren is using a rasp to form a rifle stock. He makes custom firearms, mostly early American style from the Civil War to WWI. They’re not exact reproductions, but in the style of those single shot and bolt action rifles. Listen to David Sutherland on his 44 year journey from building harpsichords to replicas of the earliest pianos. Sometimes your plans get disrupted. Sometimes you take a leap of faith. That’s the story of David Sutherland. He started as a musician. “Years after I had finished a PhD in musicology at the University of Michigan and had taught for four years, I couldn’t get a job. And I decided, well, hey, teaching didn't work out so well," he said as he sat at a harpsichord he built.